Whether your personal network is secured or unsecured, you are always better informed when you know which devices are present on your network. I've been using an app called Fing and thought you might like it. It's an excellent tool to discover network devices, scan services and analyze hosts. As Systems Managers, this is an awesome tool; whether I am on site in the corporate office or on the road fixing someone else's system. This tool can assist with knowing the environment you are working in. At home, you might be tempted to think that you don't have many devices on your network, but you may be surprised to find that you have more devices than you realized. How? In the past, the only devices most people had on their home networks were a desktop, a laptop and maybe a game system. Today, you may find your TV, home theater, tablet, smartphone, and many other devices on your network because we now have more connected devices in our homes than ever before. When you run the device, it will discover the available Wi-Fi network and report and devices it finds. 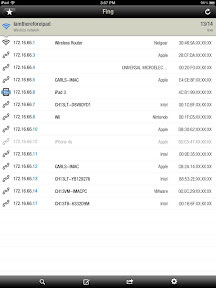 You can edit the names of the devices, add notes for the devices and even see which services are running on each device. 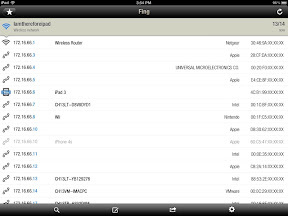 You can export any device or all the devices to an email so that you can send the data for use with other systems. Here is the report for my system. Fing for iOS is free of charge, has no Ads and works on most major platforms!